Canadian Imperial Bank of Commerce (NYSE:CM) was in 15 hedge funds’ portfolios at the end of December. CM investors should be aware of an increase in hedge fund sentiment recently. 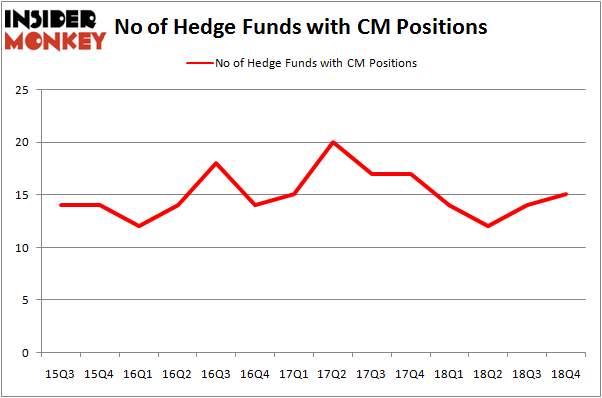 There were 14 hedge funds in our database with CM positions at the end of the previous quarter. Our calculations also showed that CM isn’t among the 30 most popular stocks among hedge funds. To most market participants, hedge funds are assumed to be worthless, old financial tools of the past. While there are over 8000 funds in operation at present, We look at the masters of this club, about 750 funds. It is estimated that this group of investors handle most of all hedge funds’ total asset base, and by watching their inimitable stock picks, Insider Monkey has brought to light many investment strategies that have historically exceeded Mr. Market. Insider Monkey’s flagship hedge fund strategy outpaced the S&P 500 index by nearly 5 percentage points per annum since its inception in May 2014 through early November 2018. We were able to generate large returns even by identifying short candidates. Our portfolio of short stocks lost 27.5% since February 2017 (through March 12th) even though the market was up nearly 25% during the same period. We just shared a list of 6 short targets in our latest quarterly update and they are already down an average of 6% in less than a month. Let’s take a peek at the new hedge fund action regarding Canadian Imperial Bank of Commerce (NYSE:CM). How are hedge funds trading Canadian Imperial Bank of Commerce (NYSE:CM)? At the end of the fourth quarter, a total of 15 of the hedge funds tracked by Insider Monkey were long this stock, a change of 7% from the second quarter of 2018. Below, you can check out the change in hedge fund sentiment towards CM over the last 14 quarters. With hedgies’ positions undergoing their usual ebb and flow, there exists a select group of key hedge fund managers who were upping their stakes substantially (or already accumulated large positions). Among these funds, AQR Capital Management held the most valuable stake in Canadian Imperial Bank of Commerce (NYSE:CM), which was worth $155.5 million at the end of the third quarter. On the second spot was Renaissance Technologies which amassed $88.3 million worth of shares. Moreover, Arrowstreet Capital, Two Sigma Advisors, and GLG Partners were also bullish on Canadian Imperial Bank of Commerce (NYSE:CM), allocating a large percentage of their portfolios to this stock. As one would reasonably expect, key hedge funds have jumped into Canadian Imperial Bank of Commerce (NYSE:CM) headfirst. Magnetar Capital, managed by Alec Litowitz and Ross Laser, created the most outsized position in Canadian Imperial Bank of Commerce (NYSE:CM). Magnetar Capital had $0.5 million invested in the company at the end of the quarter. Israel Englander’s Millennium Management also initiated a $0.3 million position during the quarter. Let’s now review hedge fund activity in other stocks similar to Canadian Imperial Bank of Commerce (NYSE:CM). These stocks are Ecopetrol S.A. (NYSE:EC), China Unicom (Hong Kong) Limited (NYSE:CHU), National Grid plc (NYSE:NGG), and TransCanada Corporation (NYSE:TRP). This group of stocks’ market caps are similar to CM’s market cap. As you can see these stocks had an average of 12.5 hedge funds with bullish positions and the average amount invested in these stocks was $196 million. That figure was $359 million in CM’s case. Ecopetrol S.A. (NYSE:EC) is the most popular stock in this table. On the other hand China Unicom (Hong Kong) Limited (NYSE:CHU) is the least popular one with only 9 bullish hedge fund positions. Canadian Imperial Bank of Commerce (NYSE:CM) is not the most popular stock in this group but hedge fund interest is still above average. Our calculations showed that top 15 most popular stocks among hedge funds returned 19.7% through March 15th and outperformed the S&P 500 ETF (SPY) by 6.6 percentage points. Hedge funds were also right about betting on CM, though not to the same extent, as the stock returned 13.5% and outperformed the market as well. Is IQVIA Holdings, Inc. (IQV) A Good Stock To Buy? 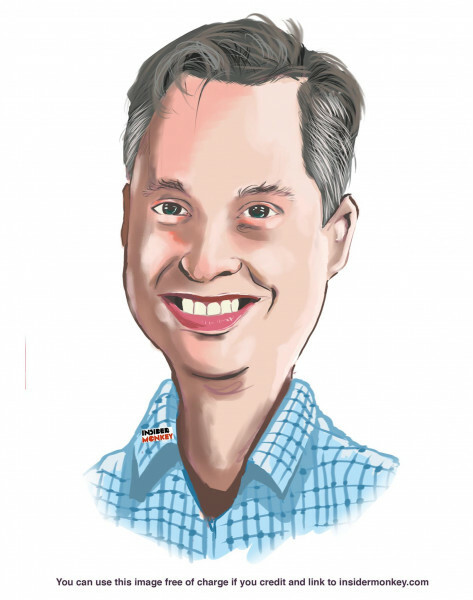 Here is What Hedge Funds Think About AutoZone Inc. (AZO) Hedge Funds Dropped The Ball On Fortive Corporation (FTV) Here is What Hedge Funds Think About BT Group plc (BT) Were Hedge Funds Right About Flocking Into Sempra Energy (SRE)? Were Hedge Funds Right About Souring On Canon Inc. (NYSE:CAJ)?